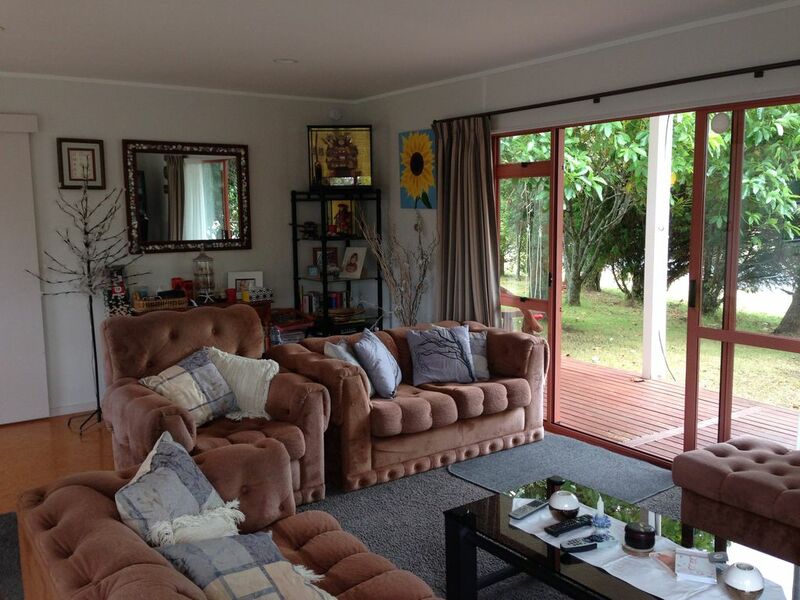 This beach house is situated on a large corner section only 5 minutes walk to the beautiful Whangamata Beach. The Surf Club (and Blackies Cafe) is under 10 mins walk away, and town centre approximately 15 minutes. Large, unfenced section, lined with feijoa hedge. Plenty of room for parking or playing outside. Open plan living, dining and kitchen. Large private deck with macrocarpa table under a classic pohutakawa tree (outdoor chairs are stored in garage so are not seen in picture). Master Bedroom: King Bed with ensuite. Ranch slider access to verandah. Bedroom 2: Queen Bed and ranch slider onto verandah. Bedroom 3: Double Bed and Single Bed. Outdoor Bedroom: Fully lined bedroom, connected to verandah with wooden decking includes Queen Bed and two single beds (bunk style). Utility Shed: External access only. Includes toilet, shower and washer/dryer. Also has caravan plug. SKY TV is available in Lounge, Master Bedroom and outside bedroom. PANTRY: Everything is stocked with typical kitchen items (tea/coffee/sugar, breakfast condiments, basic baking needs, some spices etc.) please replace if you use last of any item. CLEANING & LINEN: Please bring your own linen (sheets/towel/tea towel) and leave the bach as you found it. Linen and cleaning services are available upon request. WASHING: Washer available in main house and utility shed. Products for dishes ( both machine and hand) supplied. Born and bred in the Waikato, I come from a large family. My parents' retired from Orini to Whangamata so my connection with the town is long standing and meaningful to me. This section used to be the garden of my Grandparents' home who lived next door, and my parents lived next door to them. When the land was subdivided, I was able to purchase because I promised never to cut down the Pohutakawa Tree. The section has many food producing trees, planted by generations gone, including avocados, macadamia nuts, tangerines, apricots, plums, pears and grapes. We live in Hamilton and try to use the bach as often as we can including our son (who is in a wheelchair, hence why the house was modified) and his wife and 3 young children. The bach is really our second home. Our bach is located towards the Estuary end of Whangamata, a short 600m walk to Beach Access 14 which also has a playground (including a flying fox) and public toilets. Plenty of parking in front yard. Plenty of plastic chairs for outdoor dining also. Various board games, cards, and puzzles available. Stuffed toys and small trunk of toys are available for young ones. Whangamata was rated the #1 beach in New Zealand 2018.